The electronics industry is one of the driving forces behind industrial progress and therefore always experiences market changes very early on and very clearly. Product life cycles are becoming ever shorter and the quality requirements ever higher, which currently poses extraordinary challenges to the industry. Added to this are topics such as electromobility and energy efficiency, but also the increasing demand for virtual networking. High-tech machines and production sites need to be equipped with state-of-the-art sensors in order to be able to satisfy the market requirements for quality and cost-effectiveness. At the same time, the electronics industry itself is spearheading digital transformation and delivering innovative concepts and solutions for smart production. 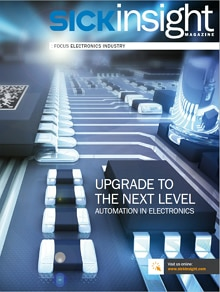 Regardless of the automation level of upgrades or modifications, sensor technology from SICK ensures investment security as it is backwardly compatible: Our Industry- 4.0-enabled sensor technology can therefore be used in existing automation architectures and is able to communicate with all levels up to the cloud. Across the world, our application specialists are therefore true industry insiders and are deeply familiar with the processes and requirements of the electronics industry. In our application centers in Europe, Asia, and North America, we test and optimize system solutions in accordance with customer specifications. Custom solutions are thus developed in close cooperation with our customers. With SICK you have the choice – and always the ideal solution. Thanks to our Vision portfolio: multiple dimensions, perfectly tailored. Thanks to our intelligent measurement technology: more quality and efficiency at each process step. End products are entering new dimensions in terms of their performance capabilities – by becoming smaller, flatter, and lighter. As industrial applications become more complex, detection requirements are increasing. But SICK has the answer: the right technology for any challenge – all in an ultra-compact housing. More and more vehicles are relying on electric motors instead of combustion engines and “intelligence” is increasingly being built into vehicles. Developments in the area of electromobility are having a massive impact on industry as a whole. New production concepts and processes are needed. Press-fit pin connections dramatically increase efficiency during the final assembly of electronic modules. The quality of each individual connection can be monitored by the Pinspector quality control system from SICK, which is already being successfully used in the automotive electronics industry.